BUNGY TRAMPOLINE - MONO BUNGEE TRAMPOLINE manufacturer, ELASTIC 4in1 SALTO trampoline, jump 9meter high (30ft). You can jump as high as you want, become an acrobat in total security and very easily and land on your feet in the middle of the trampoline. Four people can jump on 4 separate trampolines, attached in their harnesses with the BUNGEE SYSTEM - ELASTIC SYSTEM - WORLDWIDE DEVELOPER for attractions parks and THEME PARKS. - Original Patent, WORLDWIDE DELIVERY, Sales, Rentals, FINANCIAL SOLUTIONS, risk management, safety homologations and insurance, HOMOLOGATIONS and Safety Approvals -TUV, BUREAU VERITAS, CE, ISO, US Safety Approvals, UK Homologations - Trampolin fabricant patented, Swiss made, Official Olympics Games Sydney 2000 and SALT LAKE 2002, IOC and federation gymnastic tumbling, trends sports entertainment贰nd much more like Special Events Euro bungy, Sling Shot aero Acro benji Jumping Thing, Softball ShootAir, Funball ShootAir, compressed air cannons, Play ground, cannons playgrounds, Rebound inflatables, bouncing castles, carousels, CLIMBING wall, Mountain walls extreme FUN attractions, elasto trempoline safety system do somersaults andacrobatics. 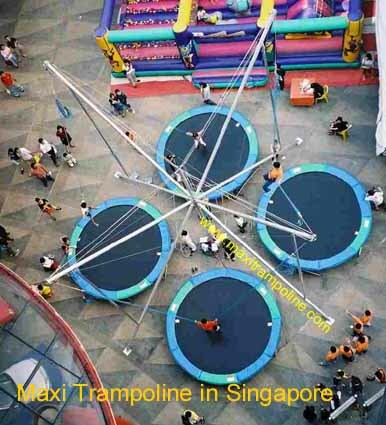 -FUN ATTRACTIONS and rides products like: the 4in1 Maxi Bungy trampoline 4 places, Maxi Bungy-trampolines 5 places, Maxi Bungy-trampoline 6 places & Salto bungee-Trampolin, Mono trampoline 1 place, mobile salto trampolines on trailer, Acro bengee euro bungy trampoline, Rock CLIMBING WALLS, portable Climbing Walls, Water mountain walls 4 climbers, Funball Shootair compressed air cannons, softball shootair Play grounds and tents, Aero space bikes, Sling Shot, gyroscope, inflatables, extreme fun rides, Sling Shot catapult, aerotrim aerosphere, astronaut trainer, gyroscope贰nd other fun sports games. -ATTRACTIONS CONSULTING we can find the attraction or product you need for your business. ORGANISATION of EVENTS, Water diving Shows, festivals, gymnastic demonstrations, spectacles�. FUN ADVENTURE PARK including 300 metres (1000 ft) high bungee jump from a cable car, a 190 metres (630 ft) high bungy jumping, a Sky diving station 150 metres (530 ft) high from the highest hanging (tibetan) bridge in Europe 200 metres (660 ft) high, a high benji jumping, bangy trampolines, a climbing wall, zorbing attraction, mountain rock wall carousel, Kiddie Rides and inflatable games for children� amazing maxi fun concepts which defy gravity旧 laws in complete safety! !